Enjoy a premium theater experience in any room of your home with the HU80KA 4K UHD projector. This must-have laser projector offers bright detailed 4K picture quality and up to a 150" cinematic display. With an incredible 8.3 million pixels (3840 x 2160) even an image up to twelve-and-a-half feet remains clear and crisp. The HU80KA 4K Ultra HD projector delivers home theater with impeccable precision and detail at four times the resolution of Full HD. Transform a wall or even a ceiling into a sprawling projection screen for an image up to 150 inches across (diagonally). That's more than twelve feet of picture displayed in the vivid clarity of Ultra HD 4K resolution. At this epic scale movies games and photos will look and feel truly cinematic. Enjoy movies and more bigger and bolder in any room day or night. Rated at 2500 lumens the HU80KA is LG's brightest projector perfectly suited for use in environments with a variety of ambient lighting conditions. High dynamic range movies and TV shows come to life with more precise color and stunning highlights. 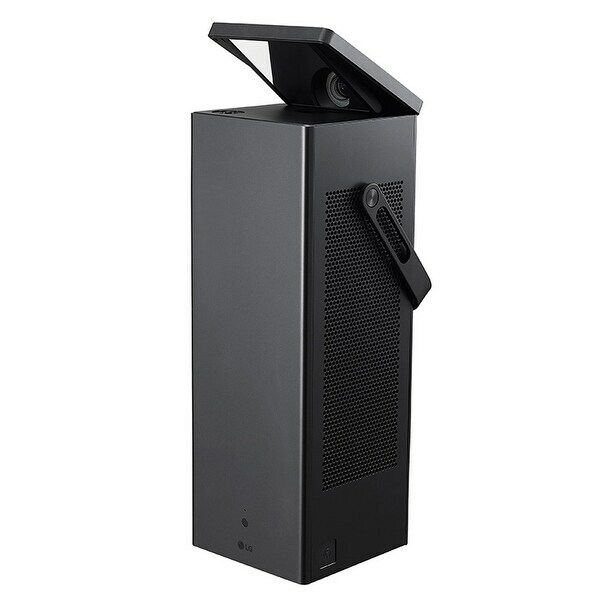 This projector is compatible with industry-standard HDR10 supporting a wide color gamut and peak brightness that exceed the capabilities of ordinary projectors. LG's exclusive Smart TV streaming content platform is simple to set up and offers fast and fun discovery of exciting premium movies TV shows and more from the most popular content providers. * The included Magic Remote makes navigation a breeze. This projector's energy-efficient light source is a powerful laser lamp that enables a big detailed image and will provide years of reliable service with no bulbs change. Watch premium content from popular providers such as Netflix YouTube and more. Wirelessly screen-share videos to this projector with a compatible smartphone or tablet over a simple Wi-Fi connection. Screen size: 40" ~ 150"